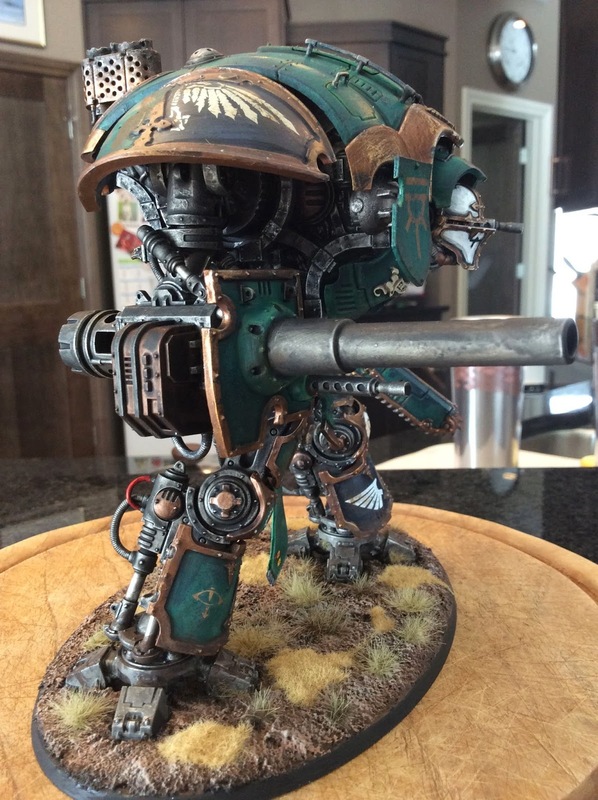 Here is my painted Imperial Knight - "El Booze" - a Knight Titan in service of the Sons of Horus Legion. This project is inspired by Dallas in many ways - from the purchase, to getting it painted in five days - I have to credit him for really spurring this on. 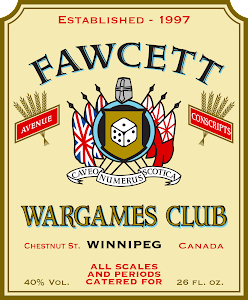 Dallas and I ordered our models from the US as soon as they were released by GW (and saved big time doing so - while I have a lot of love for Canadian retailers, GW tries to use our third-world devalued Canadian dollar to rip us off). Dallas got started on his right away, while I dithered, engrossed with my Legion Project. 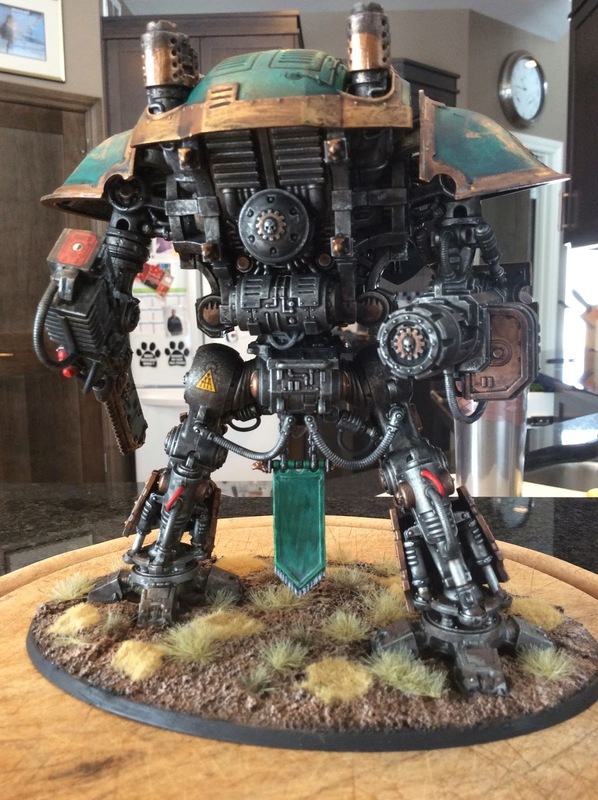 But there was a clock of sorts running - the local GW store was having a little competition for painted Knight models today. Dallas worked carefully and religiously to get his done in time. And it looked awesome! Shamed and inspired, last Sunday I realized I had less than a week left, so I dove into it. 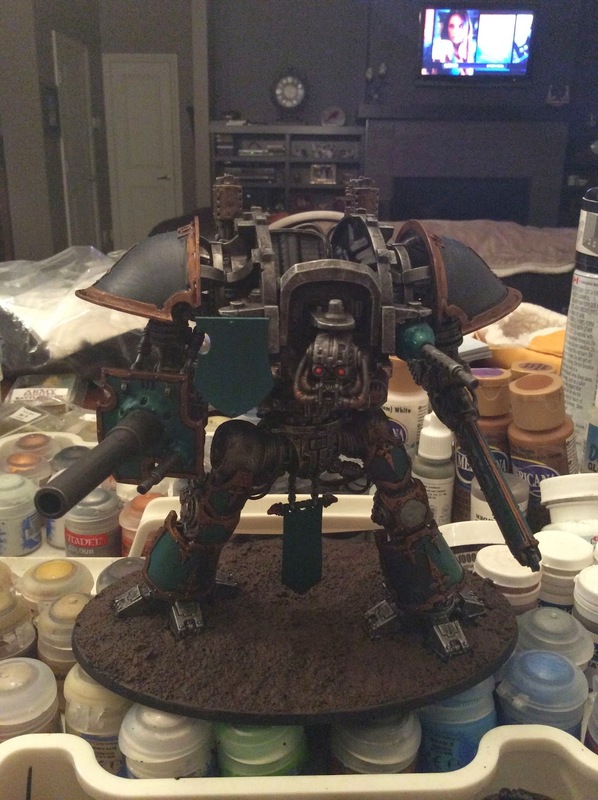 I built the model on Sunday afternoon, and painted over Monday, Tuesday, Thursday and Friday. 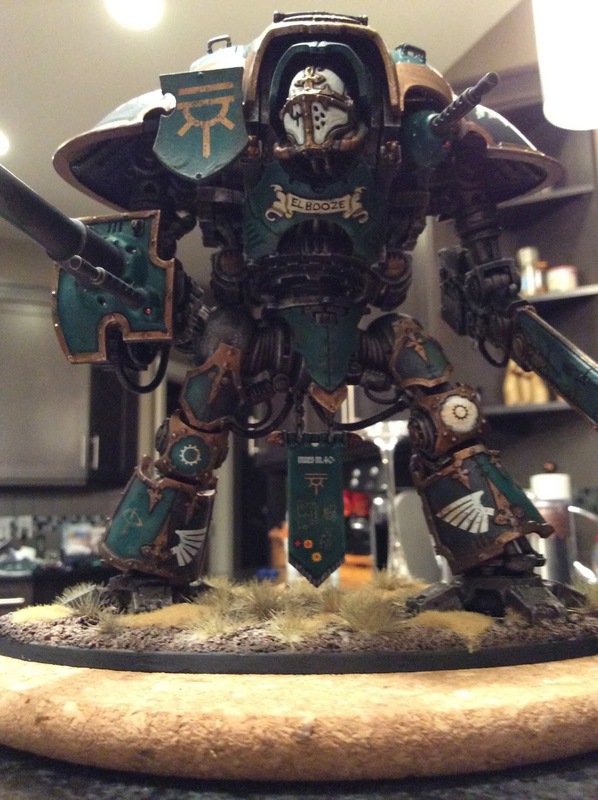 The short instructional videos GW put on YouTube about assembling and painting the Knight were excellent guides and really helped out. 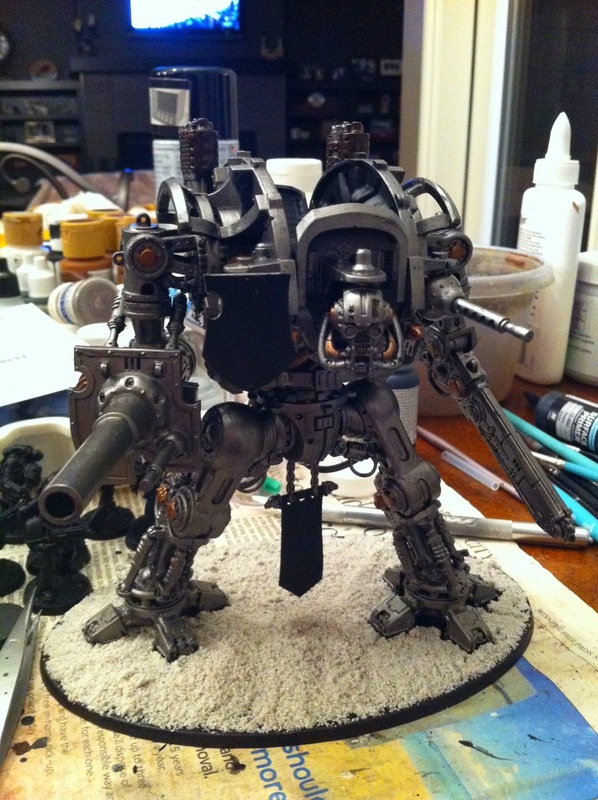 I painted the "skeleton" first, leaving the armour plates off. 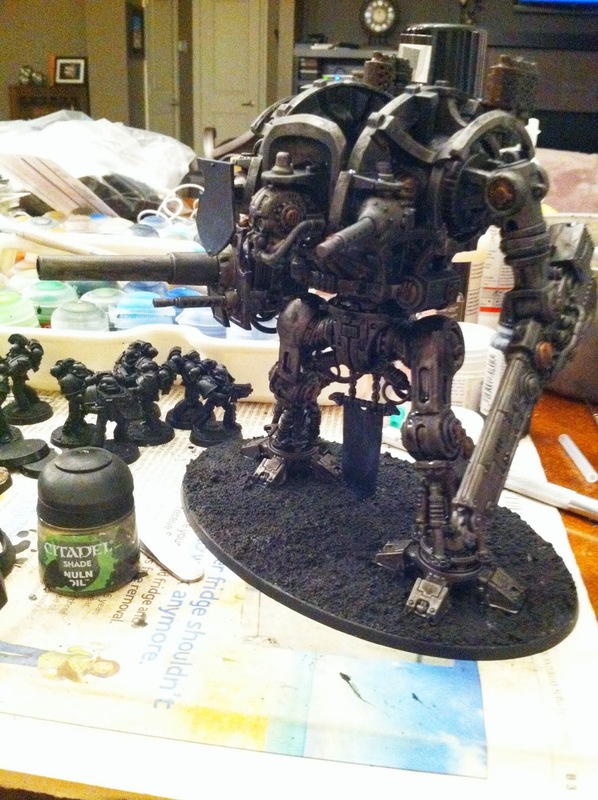 The skeleton was painted with GW Leadbelcher paint, highlighted with GW Gahenas Gold, and washed with two coats of Nuln Oil. 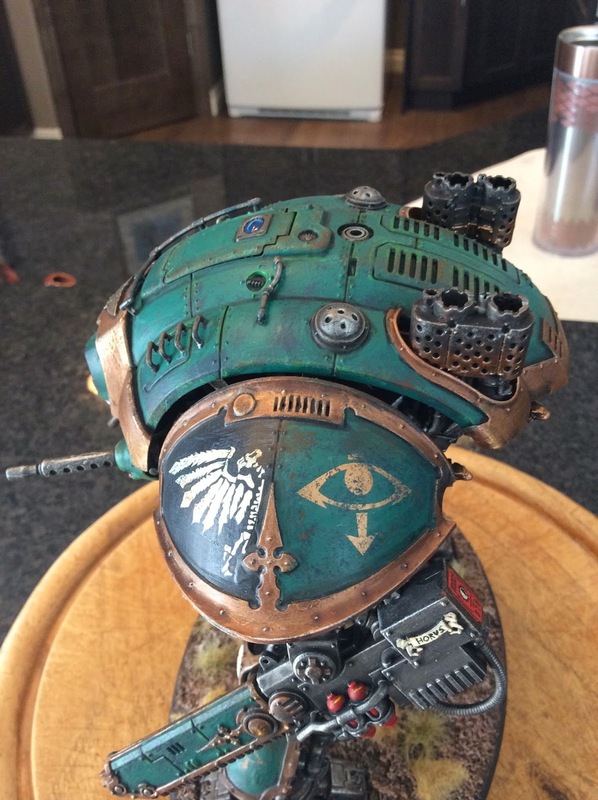 So I just ignored the whole Imperial Knight back story all together, and painted this to be part of Horus's 16th Legion. 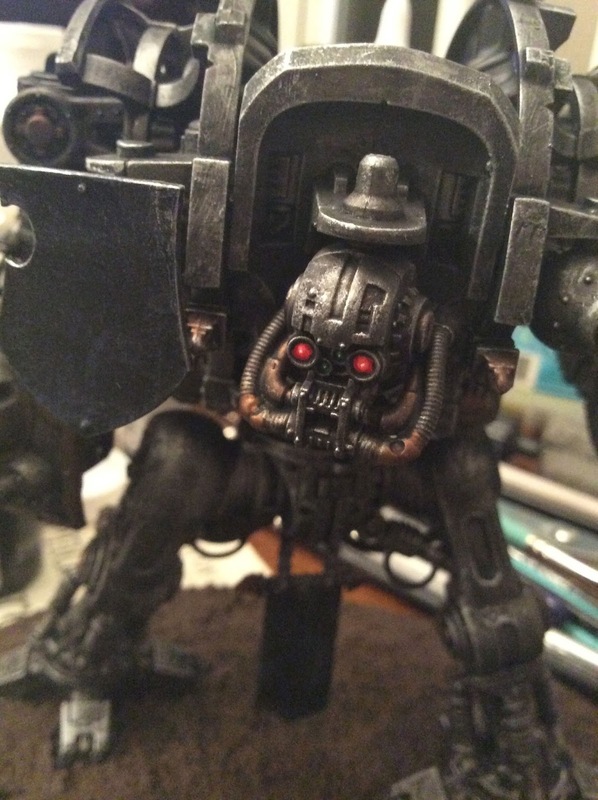 The Space Marine legions are travelling carnival hordes of weapons and troops - why wouldn't they have a few Knights in the armoury? 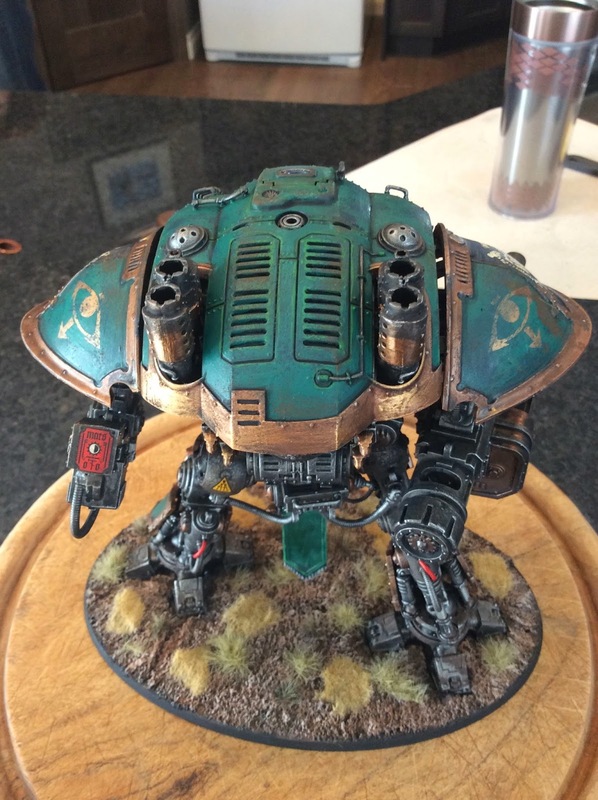 This way it can be part of the ongoing Horus Heresy action when we start playing some games later in the spring. 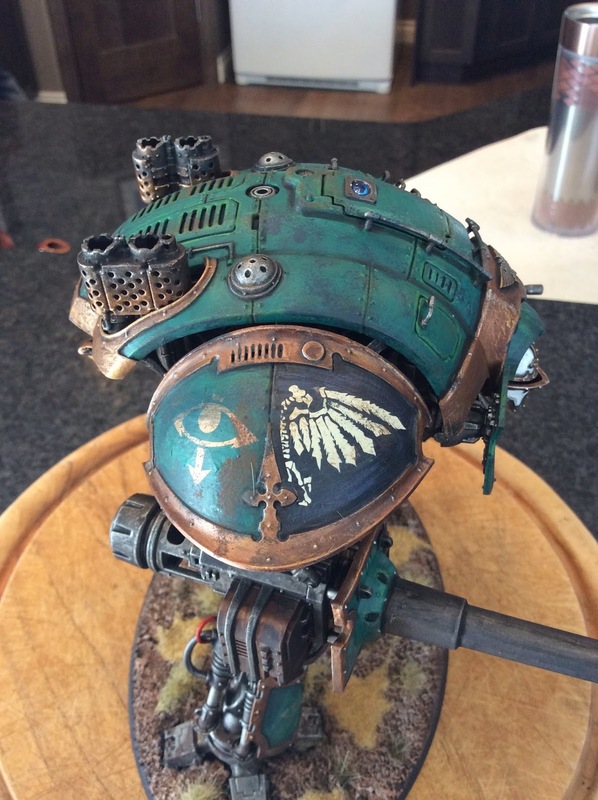 The armour plates were painted a mix of black and sea foam green that the Sons of Horus seem to like, with a few white spots (knee plate, face plate). 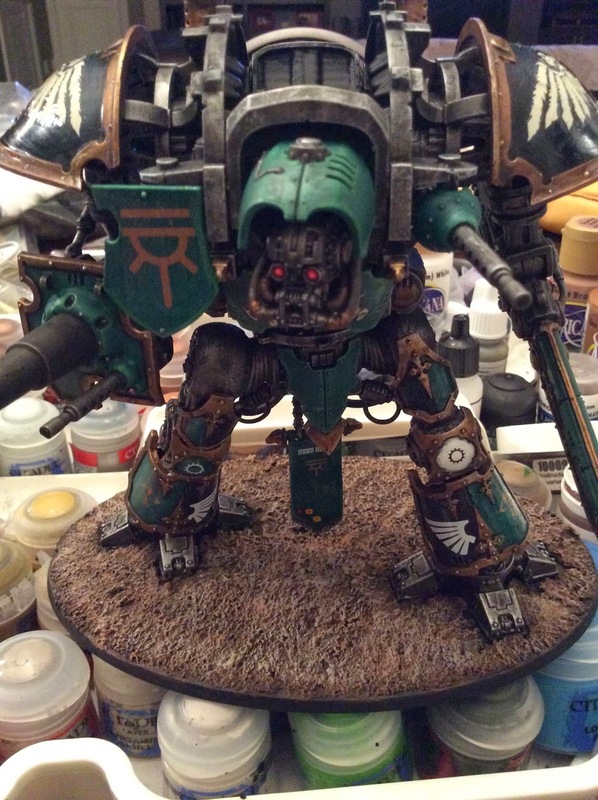 I used a mix of decals from the Imperial Knight box and a Forge World Sons of Horus decal sheet. 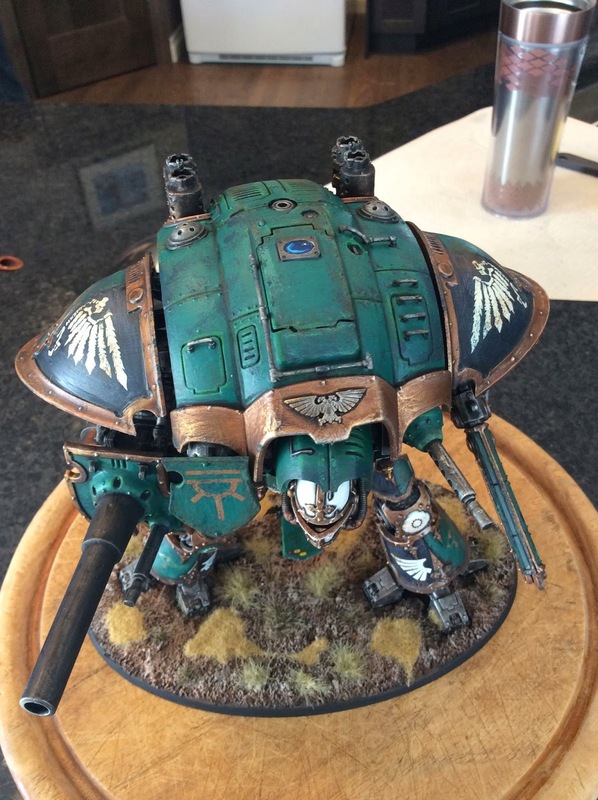 Dallas pointed out these withered eagles on the Knight decal sheet - I'm glad he did! 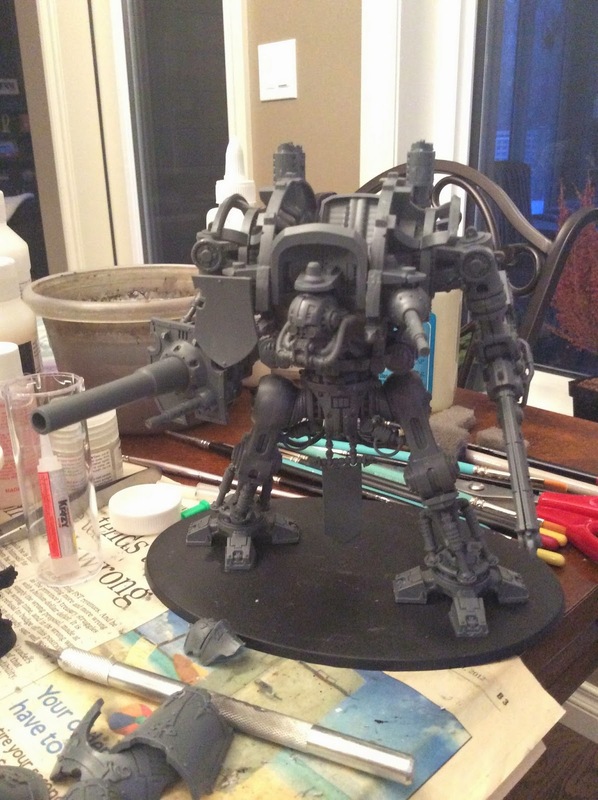 This model is one of the nicest GW has put out in a long, long time. 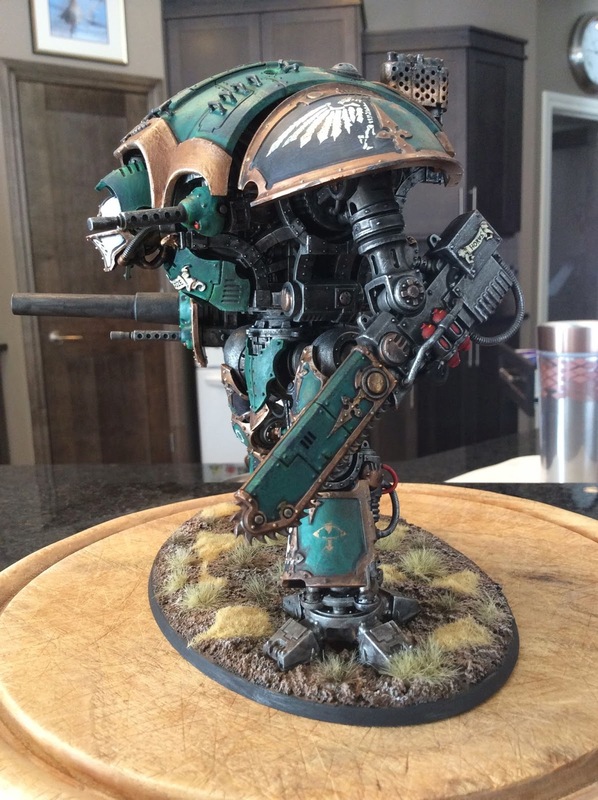 It was fun to assemble, looks really cool and was a lot of fun to paint. If you look closely at the pictures you will see I put the leg banner on backwards (duh) but other than that I didn't screw anything up too bad. The array of options for design and enhancement in the box is impressive. I opted for the rapid fire battle cannon, but am kind of regretting it after seeing how cool that melta cannon looks…oh well. 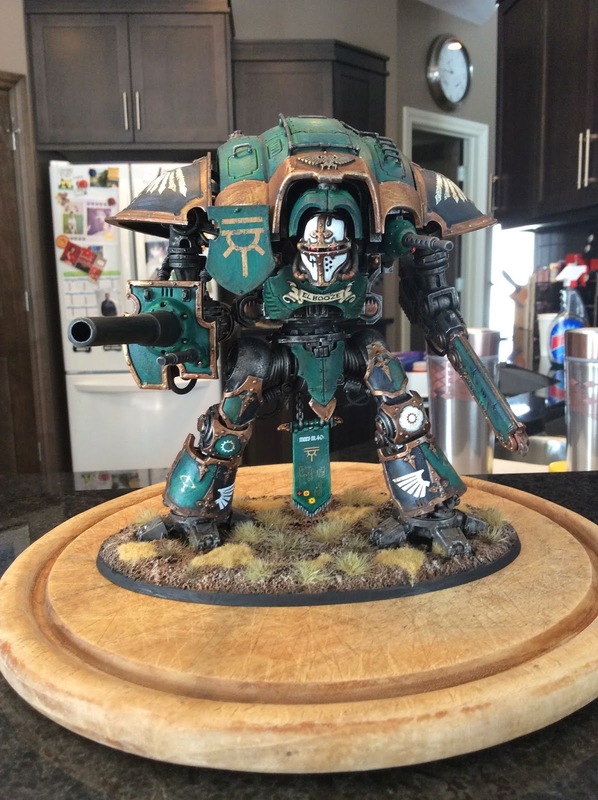 Dallas and I brought our respective Knight models out to the local GW shop for the show today - hopefully Dallas will do a post on the blog recapping that, but suffice to say there are a number of really talented painters in Winnipeg! Lovely job it looks outstanding.